A speedboat carrying Chinese tourists capsized Thursday off Koh Samet, injuring two. All 23 Chinese passengers were rescued from the water, but two had to be taken to a hospital in Rayong City with minor injuries. The boat overturned at about 2pm after striking an unidentified seabed object, according to the national park chief. Police said they’re investigating whether the boat owner, a company named Black Marlin, has a proper license. The pilot initially ran away before turning himself in later, police said, adding that he will be questioned tomorrow along with the company’s executive. Prayoon Pongpan of the national park department said no lives were lost due to the rapid rescue response after officials were notified of the accident. The two tourists taken to the hospital have been released. According to police, the Chinese tour guide said they were on a cruise around the island when the boat crashed into something, causing it to rapidly take on water. 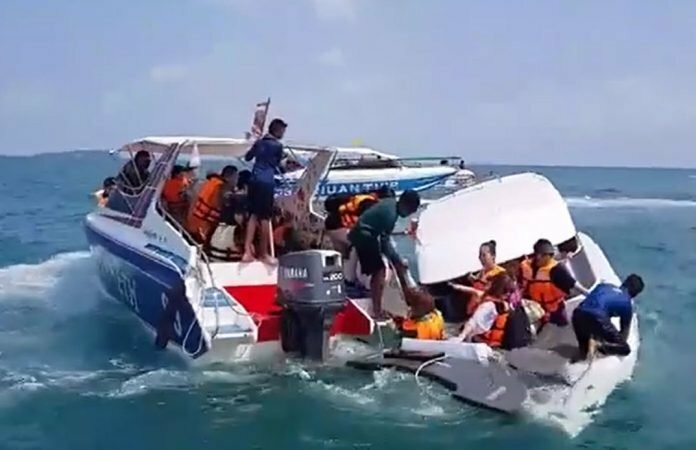 Tour boat accidents are commonplace, and the industry’s safety standards have been under heightened scrutiny since the tragic deaths of 47 Chinese tourists this past July when their ferry sunk off Phuket. Police said in December that the investigation found the vessel failed to meet regulatory standards.